STAR-FORMING FRENZY Observations of the ancient starburst galaxy COSMOS-AzTEC-1 (artist's impression above) help explain its startling rate of star formation. New images of gas churning inside an ancient starburst galaxy help explain why this galactic firecracker underwent such frenzied star formation. Using the Atacama Large Millimeter/submillimeter Array, or ALMA, researchers have taken the most detailed views of the disk of star-forming gas that permeated the galaxy COSMOS-AzTEC-1, which dates back to when the universe was less than 2 billion years old. The telescope observations, reported online August 29 in Nature, reveal an enormous reservoir of molecular gas that was highly susceptible to collapsing and forging new stars. COSMOS-AzTEC-1 and its starburst contemporaries have long puzzled astronomers, because these galaxies cranked out new stars about 1,000 times as fast as the Milky Way does. According to standard theories of cosmology, galaxies shouldn't have grown up fast enough to be such prolific star-formers so soon after the Big Bang. Inside a normal galaxy, the outward pressure of radiation from stars helps counteract the inward pull of gas's gravity, which pumps the brakes on star formation. But in COSMOS-AzTEC-1, the gas's gravity was so intense that it overpowered the feeble radiation pressure from stars, leading to runaway star formation. 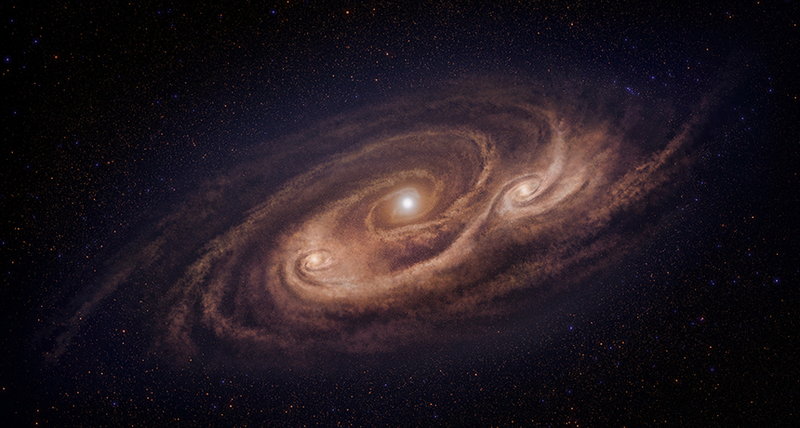 The new ALMA pictures unveil two especially large clouds of collapsing gas in the disk, which were major hubs of star formation. "It's like a giant fuel depot that built up right after the Big Bang .. and we're catching it right in the process of the whole thing lighting up," says study coauthor Min Yun, an astronomer at the University of Massachusetts Amherst. Yun and colleagues still don't know how COSMOS-AzTEC-1 stocked up such a massive supply of star-forming material. But future observations of the galaxy and its ilk using ALMA or the James Webb Space Telescope, set to launch in 2021, may help clarify the origins of these ancient cosmic monsters (SN Online: 6/11/14).